Samantha Shannon was born and raised in West London. She recently finished her degree in English Language and Literature at St Anne's College, Oxford, where she specialised in Emily Dickinson and Principles of Film Criticism. In 2012 she signed a book deal with Bloomsbury Publishing to publish the first three books in a seven-book series, beginning with 'The Bone Season'. Film rights to the novel were optioned by Andy Serkis's London-based production company, The Imaginarium Studios, in November 2012. First off, The Bone Season takes commitment. Go ahead and block some time out in your schedule right now to devour this novel. Please don't go in thinking you can just breeze through, skim, speed-read, or any other techniques you might use to quickly finish a book. The Bone Season has maps, glossaries and appendices, people! In all honesty, I started The Bone Season a couple of times, testing the water (if you will) before I dove right in. I had flashbacks to Mr. George R.R. Martin and a little series you might have heard of called A Song of Ice and Fire. With the memories of my near-obsession still fresh, I knew The Bone Season was destined to be just the same: a book where I would have to pay attention, and think, and learn new things and one that would invade my dreams. As with A Game of Thrones (A Song of Ice and Fire #1), The Bone Season is the first book of an intended series (a seven book series, actually) and as such, has the unique problem of having to familiarize the reader with the world, the characters and the situation quickly. Some may call this an info-dump, but there's really no way around it. So, we are thrown into the world of Scion, voyants, mime-lords, and dreamwalkers with an alarming alacrity. But, don't let that put you off, Steph's Stackers, you have to put your head down, use your glossary (you'll thank me for that tip later) and go with the flow. Trust is key here, all will be explained and revealed, just go with it. So, our heroine, Paige, is a dreamwalker, a type of voyant that can reach out into other people's mind over fairly long distances. Her talent (and those of many others) is forbidden by law and it's lights out for her if she is busted using it. Will this stop our plucky heroine? Um, no - what would the fun be in that? Paige, at the start of the novel is working for an underground mob-like organization that uses her talent (and the various skills of others like her) to make friends and influence people in nefarious ways. She and her cohorts are like a gang of Mafioso Mind Control X-Men led by an unscrupulous Charles Xavier. Mini-spoiler alert! This dysfunctional and magical home away from home doesn't last forever (you knew it wouldn't, right?) and through a slip-up, Paige is shanghaied to a different world that is considerably more dangerous than her previous one. So, just when you had been studying the map and glossary and you were, like: "Cool, I've totally got this whole thing down." Um, no you don't. The party just starting, friends! We are introduced to a new cast of complex characters (Rephaim and Emin and more, oh my!) and Paige's very life (and the lives of her friends) is at stake at every turn. Drama? Danger? Intrigue? Yep. Yep. Yep. 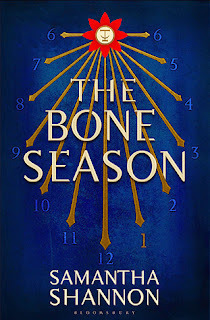 It is in Paige's time at Oxford (yes, that Oxford, but...not really) that the pace of The Bone Season cranks up from an 7 out of 10 to an 11. Why has she been conscripted to this voyant army? Who is really the enemy? Is she a jerk just for participating? She hates her master on principle, but he seems pretty cool, but that makes her a jerk again, right? Is this all like M. Night Shyamalan's crazy movie, The Village, and the Emin are really just people with sticks making noises in the night? At this point, the payoff for all of your earlier head-scratching comes in. Through a series of flashbacks, we learn more about Paige's previous life and more about the origin of her abilities. It is here that you can see the promise of the future installments. Many story threads are delicately teased out making you wanting to know more. I don't want to ruin it for you, but let me just say that plots are hatched, friendships are betrayed, alliances are made and broken, battles (small and large) are fought, kisses are kissed and lessons are learned...in the most amazing way. The Bone Season has all of the hallmarks of the start to a great series and will be buzzed about for many years to come. Ready to get your hands on your very own copy? Well, you're in luck, friend! Bloomsbury has graciously provided Steph's Stacks with a copy of The Bone Season just for you! Thank you for this giveaway! I am so excited about "The Bone Season" as a fan of fantasy fiction, and so it is top on my must-read list at the moment. Thank you so much for stopping by again! The Bone Season was great. You are going to love it! Good luck! Sending you some blog love! Wonderful review. I loved the book too! I'm also taking part in the blog tour. I'll be up on Monday! Thanks for stopping by! I hit up your tour stop and I love your blog! I actually have the e-ARC of this that I almost started before a friend of mine warned me it's a read you really have to devote time to. So I'm waiting until next week when I can devote more time and energy into it. Thanks for stopping by! I am a new follower of yours as well. I think you'll really like The Bone Season. Can't wait to hear what you think about it. I'm so glad I could change your mind :) You're going to love it! Fingers crossed!!! I want this book so bad!! Thanks!